With the 4K+, Yi has proven once again that GoPro isn't alone at the top of the action cam market in anything other than price. 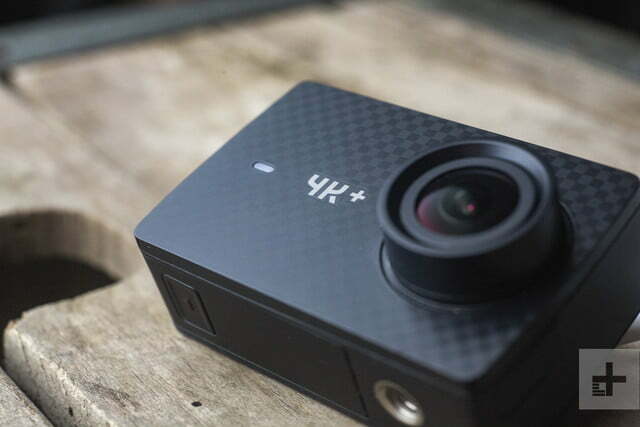 Earlier this year, Xiaomi-backed Yi Technology announced the impending release its newest action cam, the Yi 4K+. After a short delay due to production problems, the 4K+ is finally available to purchase, and we’ve spent the past month putting it to the test. 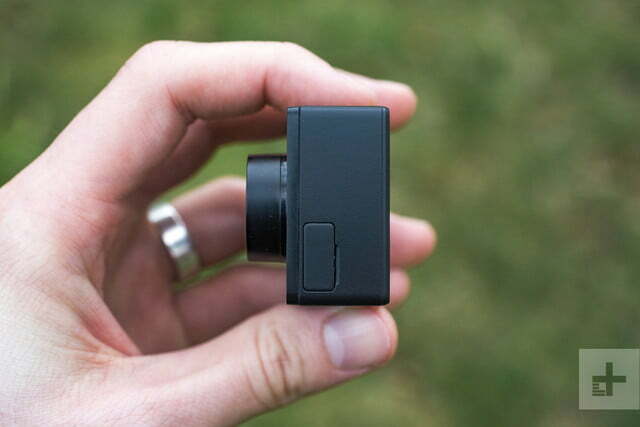 We now know why this flagship action camera is aptly being called a “GoPro killer.” It offers a wealth of features that match or beat GoPro’s high-end Hero5 Black, yet comes in $50 cheaper. Before diving into the guts and image quality of the camera, let’s take a look at the design and details. 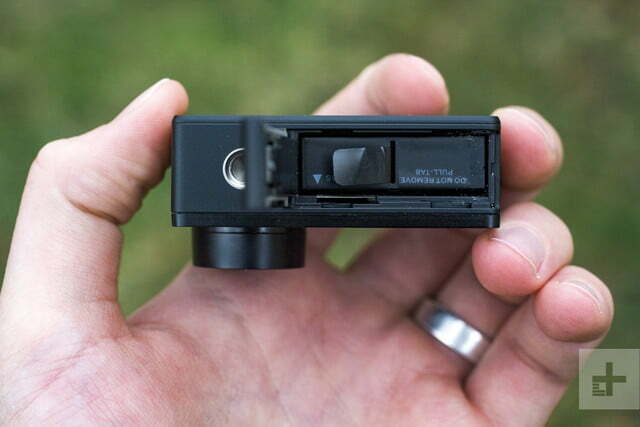 The overall shape is what you’d expect from a camera that’s targeting the market GoPro has all but monopolized. It features a familiar boxy design that’s flat on the top and bottom, but with a slight curve on the sides that gives the 4K+ a unique profile. The 155-degree, f/2.8 lens sits to the left of center and protrudes out a good bit more than its contemporary, the GoPro Hero5 Black, but it offers a decent bit of protection from bumps thanks to a subtle, integrated hood. 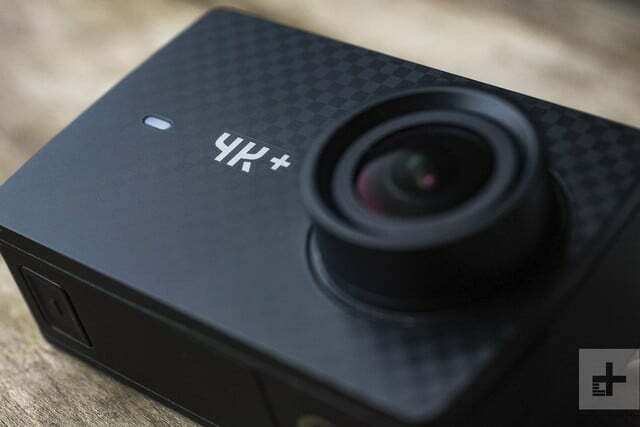 Aesthetically, the Yi 4K+ is quite the looker, as far as action cameras go. It has a single button on the entire device and a USB Type-C port on the side. On the bottom of the camera is an access door for its 1,400mAH battery and MicroSD slot, as well as a standard tripod mount. A small detail that stood out was the placement of the tripod mount. Rather than centering it on the bottom of the camera, Yi offset it and aligned it perfectly with the lens. 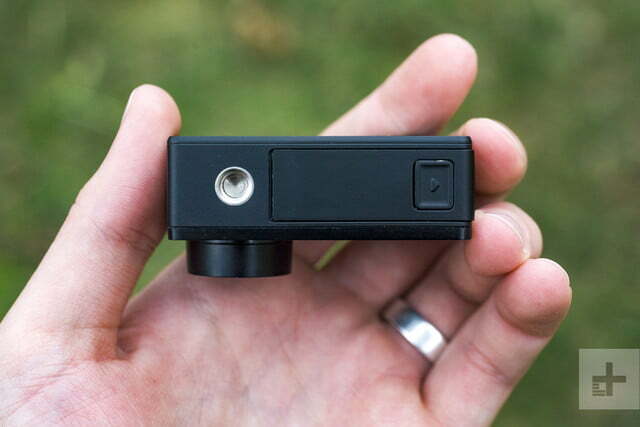 This means when mounting it to a tripod, the image will be centered on the pivot point, which is important, especially with wide-angle footage where an inch can make a big difference in the amount of distortion. The carbon fiber pattern on the faceplate of the 4K+ is a little uninspiring, but makes for a stark contrast to GoPro Hero 5’s more rugged look. The rear of the camera is even more simplistic, with nothing more than a single sheet of glass that acts as the interaction point for the 2.2-inch “retina” touchscreen. Simply put, if the design of the GoPro Hero 5 is reminiscent of a Jeep Wrangler, the Yi 4K+ would be more along the lines of a Nissan 370Z. It’s sleek and simple without any unnecessary frills. Of course, this comes at the cost of durability. Unlike the GoPro, which is ruggedized without the need for an external housing, the 4K+ isn’t waterproof, shockproof, or dustproof unless it’s inside the included housing, which makes it a good bit larger. Inside the Yi 4K+ is where the real fun begins. Starting at the core, the Yi 4K+ action cam is built around Sony’s Exmor R 12-megapixel CMOS backside-illuminated sensor. Powered by a quad-core ARM Cortex 64-bit processor and 2GB of RAM, the 4K+ shoots video in the h.264 format at up to 135 megabits per second. 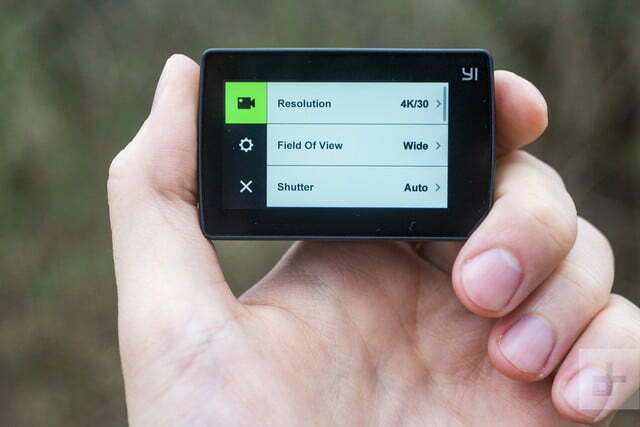 Yi was once considered little more than a GoPro knockoff; the 4K+ shows it is anything but. 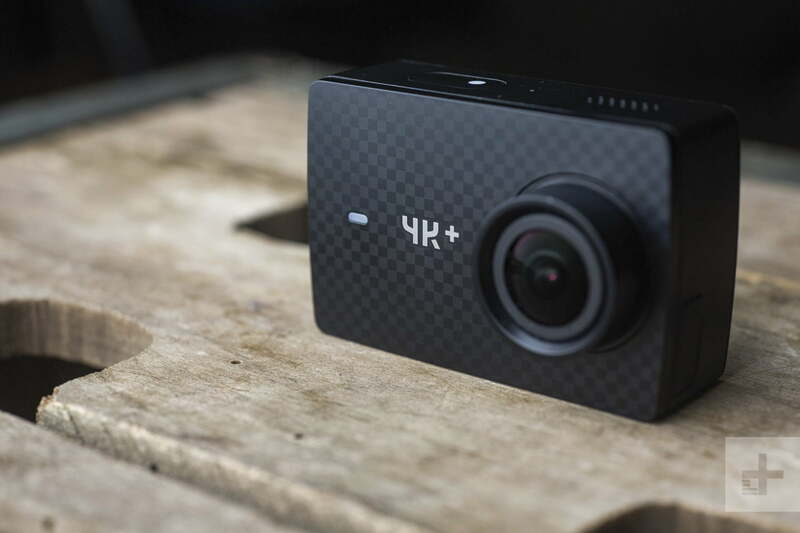 More importantly, it is the first action cam to offer 4K video at 60 frames per second (fps), beating out the 30 fps of GoPro’s flagship Hero 5 Black. This is a rare achievement, with even the vast majority of high-end interchangeable lens cameras limited to 30 fps when shooting 4K (the Panasonic Lumix GH5 being one exception). Even if the idea of watching 4K in 60 fps doesn’t impress you, you can use that higher framerate for crystal-clear slow motion playback at 30 fps without dropping to a lower resolution, as would be required on the GoPro. 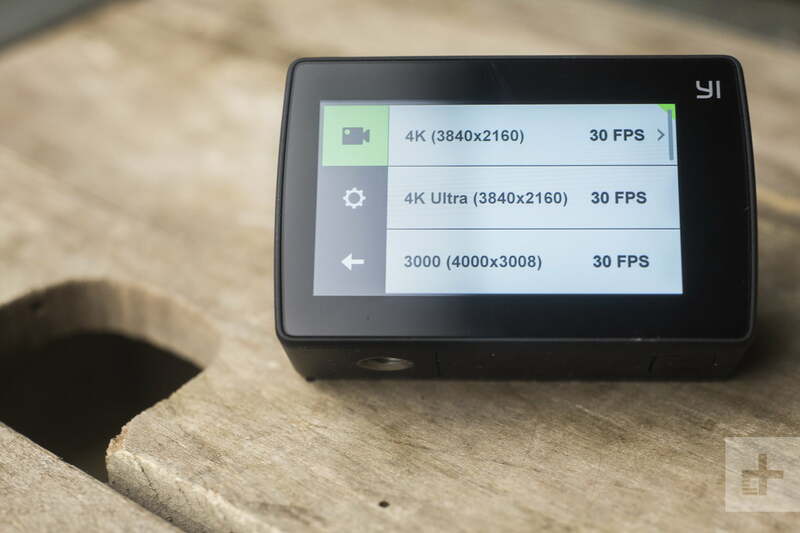 However, if extreme slow motion is your thing, the Yi 4K+ might leave you a bit disappointed. Interestingly, the maximum framerate in Full HD 1080p is unchanged at 120 fps, exactly equal to the Hero5 Black. Similarly, 720p remains limited to 240 fps. While these numbers aren’t bad, with the processing power to churn out Ultra HD footage at 60 fps, the 4K+ should have theoretically been able to shoot 1080p at 240 fps — which would have given it another unique advantage over the competition. Unfortunately, the reason Yi couldn’t push beyond 1080p/120 is apparently due to the limitations of the h.264 codec. During our testing, we captured footage in a variety of modes. Specifically, we tested 4K video at 60 frames per second and 30 frames per second with Yi’s proprietary electronic image stabilization turned on. Yes, unlike the Hero5 Black, the 4K+ can use digital stabilization at any resolution, including 4K (but not at 60 fps). In favorable lighting conditions, the image quality of the 4K+ is nothing short of incredible. Regardless of the mode you’re shooting in, the image stays considerably sharp from edge-to-edge. Dynamic range is solid when using the “Yi Color” profile, but for times when you want a little more latitude, Yi has included a “Flat” color profile, which drops the contrast for more control in post with color grading — similar to what’s available under GoPro’s advanced Protune settings. If the fisheye look isn’t something you’re fond of, the 4K+ has integrated lens distortion correction. In our tests, both with stills and video, the corrected images were absent of any distortion, even towards the edge of the frame. The 4K+ isn’t waterproof, shockproof, or dustproof unless it’s inside the included housing. The electronic image stabilization proved impressive, as well. It won’t be smoothing out every bump from a rough mountain biking session, but it dramatically reduces the shakiness and almost entirely eliminates shake when walking with it handheld. In low light conditions, the 4K+ has a dedicated “Auto Low Light” mode that adjusts the settings to offer more detail in dark scenes. While it did improve detail in the shadows it also increased the noise present in the video. So don’t expect to use the 4K+ at night for important video without an external light source. Action cams are notorious for their poor battery performance and the 4K+ isn’t much different, although the 1400mAH battery does last longer than expected. 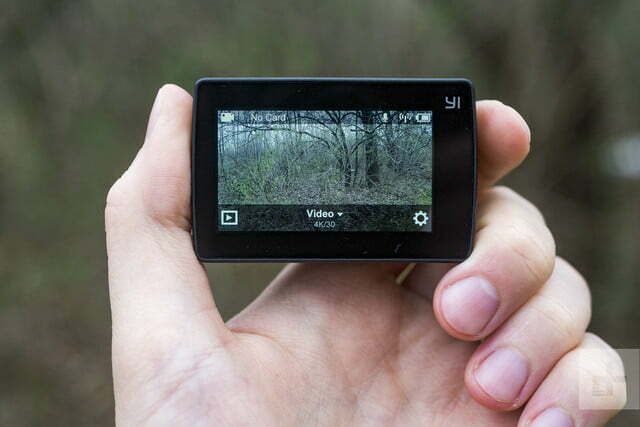 Yi claims 71 minutes of battery life when recording 4K video at 30 frames per second. In our testing, the camera lasted a good bit longer at 90 minutes. But that was in ideal (read: warm) weather and with electronic image stabilization turned off. The sole I/O on the 4K+ is a USB Type-C port on the side of the camera. This single port is used to charge the camera, offload media, and connect an external microphone. USB Type-C is a nice touch, but data transfer speed is limited to 40MB/s. Still, this is twice as fast as the 20MB/s offered by the predecessor, the original Yi 4K. The only complaint I have with the sole port on the 4K+ is the cover protecting it proved difficult to open. If you tend to keep your nails trimmed, you might struggle to access it. On the wireless front, the 4K+ offers both integrated Wi-Fi and Bluetooth. Bluetooth is used with accessories, such as Yi’s own remote, while Wi-Fi is used to connect the 4K+ to Yi’s dedicated smartphone app. Speaking of the accompanying app, Yi’s Action App is available on both Android and iOS. Once downloaded and paired with the 4K+, the app gives complete control over the camera and shows a live feed of what the camera is seeing. In our testing, the live feed proved incredibly responsive with minimal lag, regardless of shooting mode. The app also lets you download photos and video directly from the 4K+ to your phone, and Yi claims an update will be coming that will let you livestream video to Facebook and YouTube using your smartphone’s internet connection. Once that update arrives, this will be another feature unique to the 4K+ (although, you can livestream to Twitter with a GoPro using the Periscope app). Yi offers a one-year limited warranty that covers the standard defects that may arise from materials or workmanship. Yi also offers a 30-day money back guarantee. If, for any reason, you’re not happy with your purchase, you can return the items in their original packaging within 30 days of the purchase date and receive a full refund. Return shipping is on you, but that’s a small price to pay for some peace of mind if you’re not sure the 4K+ is right for you. 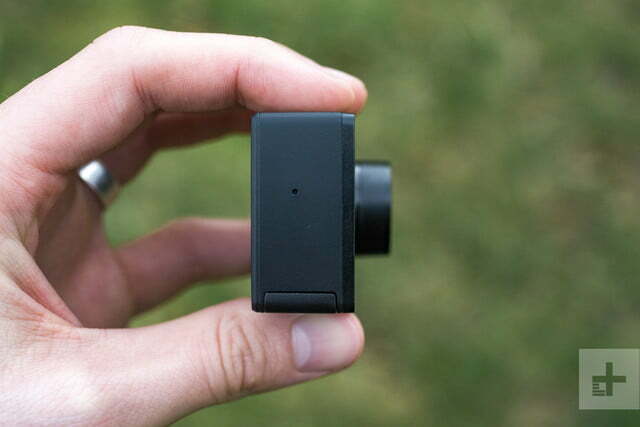 Yi was once considered little more than a GoPro knockoff. The 4K+ shows it is anything but, not only matching GoPro’s flagship Hero5 Black model, but even surpassing it in a few areas. Its affordability, comparative to GoPro’s offerings, is its biggest appeal, with a street price of $340. But its impressive image quality and features make it even more enticing for action-seeking adrenaline junkies. 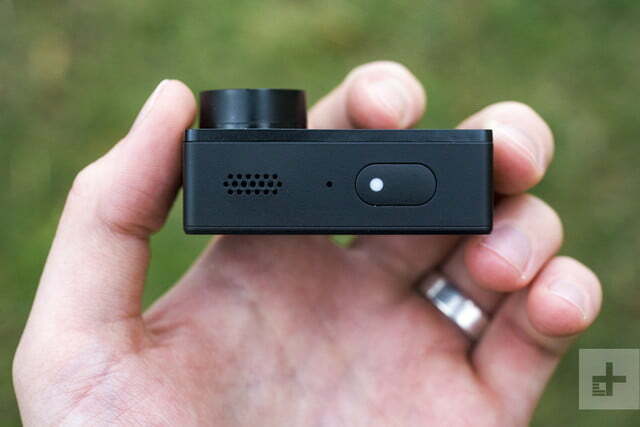 For the price range, you’ll be hard pressed to find a more capable action cam. The Yi 4K+ offers impressive specs and superb image quality on par with GoPro’s more expensive Hero 5 Black. It’s not waterproof out of the box, and lacks the impressive lineup of accompanying smartphone apps GoPro has, but it’s a capable little camera that beats out the GoPro both in framerate and price. Considering it’s an action cam, it’s safe to say you’re more likely to kill this camera during an adrenaline-fueled adventure than to discard it due to the lack of imaging capabilities or failure from old age. Its 4K resolution at 60 frames per second puts it a step ahead of GoPro’s current offerings. Even a few generations down the road, the 4K+ should hold up well in terms of resolution and speed, especially if Yi continuously updates its firmware and accompanying apps, which it has a solid record of doing. The 4K+ gives the GoPro Hero 5 Black a run for its money, both literally and figuratively. 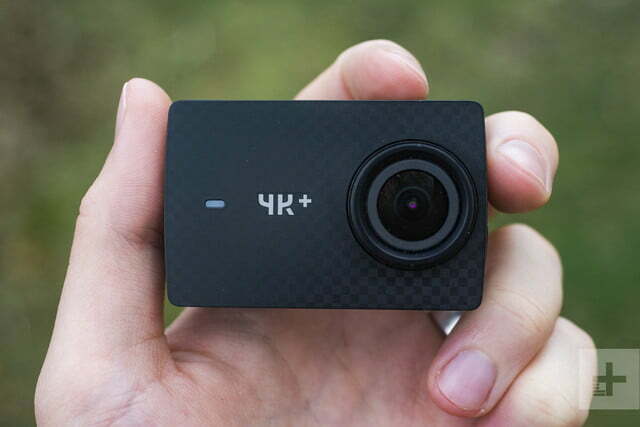 If you don’t mind the lack of GoPro branding and want to save a few bucks in the process, you should absolutely go with the Yi 4K+ action cam. If you want a camera that’s ruggedized and waterproof out of the box, without the need for external housing, then the GoPro Hero5 Black might be your best bet, and may be worth the $60 premium. Update December 27th, 2017: Yi has updated the firmware multiple times since the release of the 4K+ Action Cam. New features include new languages (Russian, Chinese, German, French, and Italian), better RAW photo capture, improved voice control, more reliable live-streaming, additional shutter speed options, more accurate color renditions, better battery life, and better support for MicroSD cards. The original review was published on May 19th, 2017.